Beri Weber has given the oilom a gift – an album with Shabbos songs. But not just an album of tunes that relate to Shabbos, but rather from the first moment on he gives us a glimpse of how he “lives” Shabbos – how he actually experiences it. It doesn’t sound “gemacht”; just the opposite. It is authentically warm and inspiring. 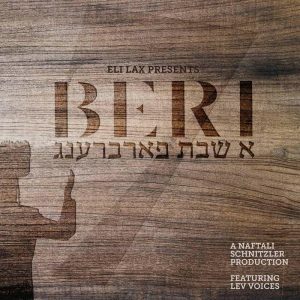 The album was produced and arranged by the very talented Naftali Schnitzler and is accompanied by a choir called “The Lev Voices”. It also features a boys choir by Yossi Glick. It starts off with a Medley called “Knisas Hashabbos” and it is actually acted out as if he is walking in to the shul singing “Vishomru” from Avrohom Fried composed by Yossi Green. Then he transitions in a Carlebach style “Git Shabbos”. After a brief pause, he sings “Kidshu brich hee” by Meilech Kohn. I had never heard it before, but it’s a very nice hartzige nigin that has 3 stanzas – actually 1,2,3,2. Then he sings a “Shulim Aleichem” composed by himself that starts off like the Shulem Aleichem that they sing in Pupa. After that comes “Azamer Bishvuchin” to the tune of “Bar Yoichai”. This gives the medley a Heimish-Israeli-Yerushalmi gefeel. But then comes a song “Yismechu Bemalchuscha” composed by Shlomo Katz that has similarities to Carlebach and finishes “Shreit shoin Yiddelech Git Shabbos” in the Vzhnitzer nisach. Once again “Git Shabbos” from Carlebach. The finale is Just One Shabbos from MBD first in Yiddish, then English. The 2nd medley is called “Leil Shabbos.” It starts off with a story called “Git Shabbos” from Michuel Schnitzler. Next comes “Hashabos Noam Haneshumes” by Shloimie Daskal. The words are from Koh Echsoif by Rav Ahron Hagodoil from Karlin. So it is fitting that it transitions to Koh Echsoif! Then by the part that starts “Viyiyi Rachameichu Misgoililim” he says it it in plain Mameh lushen ” Riboinoi Shel Oilom hob of inz rachmunes” . That sounds more from the heart than the regular words. Then comes a part from the Pittsburger Koh Riboin and then quickly to the introduction part of “Rachem Bechasdeichu” from Moshe Goldman A”H from Camp Shalva. It goes together beautifully and he sings it with very nice chazunnes. Then he jumps to Yibune Hamikdosh from Duvid Werdyger and then to Shlomo Carlebach’s famous Yiboneh. Interesting – he doesn’t sing it with chassidishe havureh even he sang other Carlebach’s with it. He sticks in a kneitch from MBD nigun Shabbos then goes back to Yiboneh to end the medley. Next comes V’taher Libeini composed by Shimshy Neuman – not a medley. it is a wonderful slow song that tugs at the heart strings. Then there is this awesome Yiddish part “tatte reinig ois mein hartz az ich zil dich kenen dinen” – “Tatte purify my heart so I can serve you” – basically the translation of the words of the song – Vitaher Libeinu. The 3rd medley is called “Shabbos Tish”. It starts with “Lomir machen kiddush of di gantze velt” sung by Avrum Mordche Schwartz and composed by Sruly Lipschitz. This works like a “Lesheim Yichud” before Beri unleashes his own nusach of kiddush that’s a Heimish/Carlebach hybrid. Next comes Nigun Shabbos – Viznitz which I always thought was a Skulener nigun, but maybe they sing it in both places. Then towards the end we hear background clapping before he finishes off “Shabbos, Shabbos Koidesh” Next is the famous Koh Riboin by MBD from his album “I’d rather Pray and Sing” then it transitions in to Shvuchin Asadeir from the famous Bobover Koh Riboin, then Ravrevin from MBD Moshiach then to Eloku from the Pittsburgher Koh Riboin (the second shtickel on the album that he sings from that nigun) – then to Lemikdusheich sung by Beri and composed by Chaim Blumenfeld. So he basically sings Koh Riboin which each shtickel from a different nigun! Very creative and definitely up my alley. Then comes a Viznitzer Shabbos Waltz – then Keser sung by Isaac Honig and composed by Lazer Kalish which has become a huge hit. Then comes the famous Burich Keil Elyoin composed R’ Moshe Goldman A”H from Camp Shalva and finally Keil Mistater from Rupshitz/Dzikhev. So he mixes his nigunim from Friday night to include Shabbos day and Shulesh Seedes also. The 4th medley is called Gaguim L’shabbos. It starts off with the famous Git Shabbos from Viznitz. This is also actually the second time he sings the part “Shreit shoin Yiddelech Git Shabbos” on the album. Next comes Shabbos Is Shein by Rav Moishe Wolfson sung with true dveikus. Next comes Shabbos Is Teier – a velts nigun – then it flows into Fire by Carlebach . Then comes V’anpuhu Nhirin sung by Lipa and composed by Motty Ilowitz. Next is V’hanchleinu by Carlebach before it goes into Lchu Doidi from Sruly Werdyger’s first album composed by Baruch Levine and the final song is the inspiring Lukeil asher shovas sung by MBD and composed by Yossi Green – one of my favorites. The final medley is called Lekuved Shabbos and it features “Zusha” – a band featuring Shlomo Gaisin and Zachariah Goldschmiedt. They start off with Yismechu B’malchischu from the nusach hatefilah and flow into Shabbos Koidesh from Breslov although I think it is actually an Alexander nigin. Then comes a song plainly called “Nigun – Breslov” which is sung in many Litivishe places for Lecho Doidi. Next comes Nigun Azameir B’shvuchin from Chabad Then it’s Bnei Heichulu from Chabad. The finale is Mizmoir L’dovid by Carlebach and it ends off very quietly – a sweet shtick. So if you’re in the mood of treating yourself or someone else to a geshmake, hartzige, creative Shabbos medley album, Shabbos Farbreng from Beri Weber (also available in an a cappella version) will delight you and enjoy listening to over and over again. Nice review! Very helpful in identifying the origin of many songs I was interested in. I have one correction though. The song Kidshu brich hee by Meilech Kohn actually has four stanzas 1,2,3,4,2. What a gorgeous song and an unbelievable job by Beri!! Thank you Chaim for the feedback and correction!